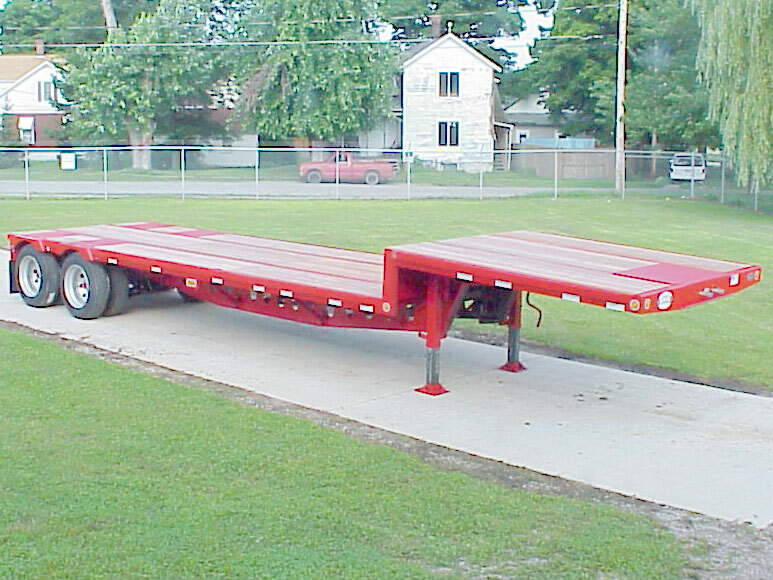 This 35-ton capacity ROGERS single drop deck is designed for higher load concentrations and has a shorter overall length than standard trailers to get into tight places. The full-width flat gooseneck includes a steel-covered toolbox over the king pin, and it has heavy-duty two-speed landing gear. Fabricated main beams are deeper than normal for greater carrying capacity with less weight. The cut-out holes reduce weight without compromising strength. The level deck has 1-1/4" apitong wood and 1/4" tread plate flush wheel covers. Rub rails on the rear and both sides have stake pockets on 24" centers and pipe spools between them. This trailer features a two-axle, heavy-duty spring suspension with 255/70R radial tires and is equipped with customer specified flange mount LED lights. Customer specified steel disc wheels with a burnished finish.